Petromalt hairball remedy is a product designed to help your cat eliminate any hairballs, and to lubricate the digestive system so that any future hairballs are prevented because any hair passes through and is quickly eliminated. This product is similar to Laxatone hairball remedy, and Petromalt comes in two flavors that cats seem to enjoy. When Petromalt hairball remedy is used on a regular basis this product can treat more than just hairballs, and will eliminate any constipation, vomiting caused by hair consumption, and a dry cough. Petromalt is available in both malt and tuna fish flavors, so getting your pet to take the treatment is normally not difficult. Petromalt for cats is vet approved, and the product contains both mineral oil and Glycerin. This product works as a laxative, and this relieves constipation as well as eliminating hairballs. Petromalt hairball remedy can be used on cats and dogs as young as four weeks old, and does not contain any drugs or harmful chemicals. This cat hairball remedy comes in a paste form, and applying the product is easy. You simply squeeze out the desired size ribbon on the paw or nose of your pet, so that it can be licked off. 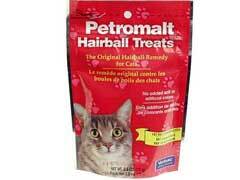 Petromalt hairball remedy is used by many pet owners to keep cats healthy and hairball free. Not only are hairballs uncomfortable for your pet but in rare circumstances they can become dangerous as well. Using Petromalt regularly will keep your pet’s digestive system healthy and working properly. The cost for this treatment is very reasonable, and the benefits are undeniable. The all natural ingredients are gentle on your pet, and can eliminate some cat illness symptoms that hairballs can cause. If your cat has any medical conditions you should check with your vet before using any treatment, whether it is over the counter or prescription, to ensure that there are no problems.